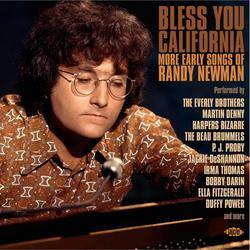 Following on from the success of “On Vine Street”, Ace’s first collection of compositions by Randy Newman, comes “Bless You California”. As with the previous volume, the focus is primarily on Newman’s early work for Metric Music, and once again there’s a diverse array of classics, near-misses and obscurities on offer here. Listening to the emerging talent of one of the world’s most gifted songwriters makes for a fascinating 67 minutes.